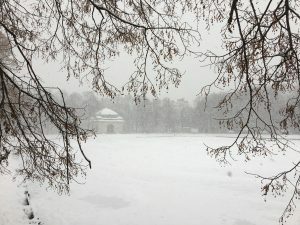 MUNICH has frozen in the grip of the coldest January for years. Sub-zero temperatures have sent many cowering into their duvets. 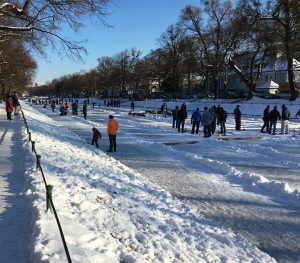 Others – hardy, warm-blooded snow and ice enthusiasts – are emerging from hibernation and taking advantage of the arctic conditions for an increasingly rare chance at local winter sport. In November, optimistic purveyors set up sheds along the Nymphenburg Canal, hoping that this year they might get lucky. In previous years, the shacks remained boarded up and lonely alongside the stubbornly liquid waterway. But this year the weather complied, sending the mercury plummeting and freezing up the canal, which stretches eastward from Nymphenburg Castle. 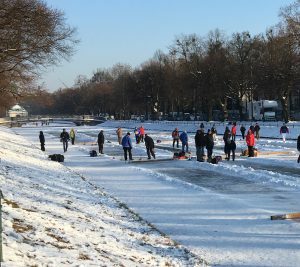 On one end, where the canal opens out, skaters skid and twirl on the ice in front of the Hubertusbrunnen. Further down, the canal is portioned out for curling. 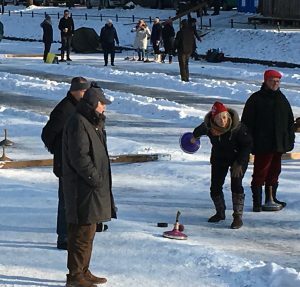 An ice version of boules, curling involves sliding a heavy disk down to a target. Strolling down the path along the canal, you can hear the skates and curling stones scraping across the ice, a sound like marble masonry. You also hear cheers and laughter as the players celebrate their success – or just their joy at being out to play under a cobalt blue sky, walking on water. Their large thermal bags of provisions and steaming mugs show that they’ve come prepared. The odd burgundy splash on the snow and ice indicate that the hot beverages they’re drinking aren’t just coffee.